I tend to wind up being “Team Leader” in RPGs. I don’t know quite how it happens. Aenaiyah, my Acanthus Mage, doesn’t care for any sort of responsibility but she’s managed to turn into the “Voice of Reason” of her Cabal . . . and anyone who knows the character or has read Mage Mistress’ blog should know how terrifying this fact is. Valeria de Valfierno, by sheer amount of points dumped into Diplomacy and Bluff (in an effort to keep her own hide out of trouble), is the de facto spokesperson for the clumsy little Pathfinder group known as Cailean’s Aces–a name she concocted. One time I willingly took on the role of leadership I swiftly regretted it. 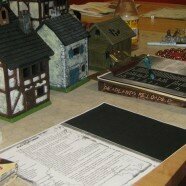 It was a Deadlands game, being run at my favorite gaming haunt, Ravenblood Games. I sat at the table with three other excellent players: Mage Mistress, her brother, and Doc (who plays Argus the Obrimos Mage in the same campaign I play in as Aenaiyah). Doc decided to play a card-dealing, chance-wielding Huckster. Mage Mistress and her brother decided to play the Payne siblings, two not-so-intelligent cowboy types. That left me playing Rory (this was ’08 or ’09, so it was NOT a Doctor Who reference; my Rory was also a lady) who wound up being the head of this little group of misfits. 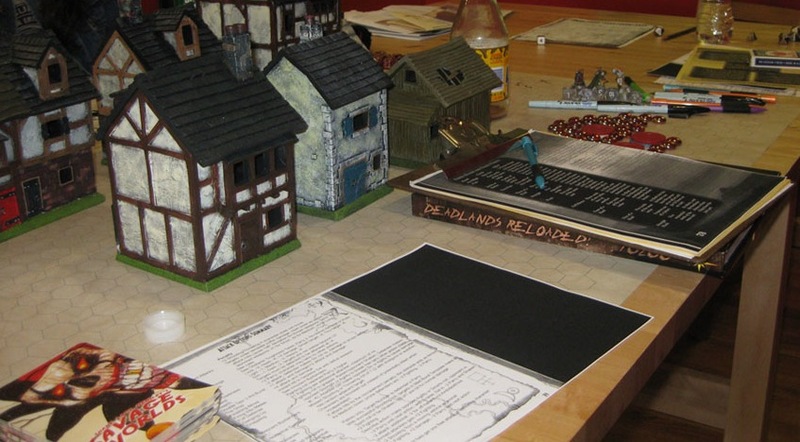 The Deadlands table, shortly before Rory’s ill-fated Character Creation. We got the standard “Things Are Weird in Town X, Go Investigate!” line from our Pinkerton boss and went to ride out. Except Rory couldn’t find the Huckster. When she finally located him, she was shocked to discover him in flagrante delicto with one of our hometown beauties. After much yelling, the Huckster would not be budged until he was finished, so Rory ordered the Payne siblings to saddle up and the three of them rode out. Infuriatingly, the Huckster made better time than anticipated and caught up with the group almost immediately, so Rory couldn’t even report him for dereliction of duty. The Huckster would prove to be the Great Bane of Rory’s Existence. The Payne siblings were collectively no smarter than the local tumbleweeds. They sought out the Huckster’s counsel, and he was all too glad to provide it–if they paid him a “small” fee he allowed them to pick random cards from his deck and completely bullsh*tted what those cards meant. This eventually led to whenever one of the siblings thought they had spotted a ghost, the brother would shout “Haints! Haints! Haints! Haints!” and the sister had to follow that immediately with her own shout of “Haints!” Failure to do so would mean they’d fall under the ghosts’ power. Rory grew tired of this word very rapidly. She could not convince the Huckster to be straightforward with the siblings and so gave up–the only thing she was interested in anymore was getting this job done and getting a hard drink of whisky afterwards. Then something even worse happened: the idiocy actually proved useful. While Rory and Charity Payne (the sister) were off following up one lead, the Huckster and Charity’s brother became victims of a haunting. Brother Payne began shouting “Haints! Haints! Haints! Haints!” at the top of his lungs. Charity made her listen check and shouted “Haints!” in response. So Rory and Charity ran to meet up with Brother Payne and the Huckster and try and fight off the ghosts. Now, very early on in the game, Brother Payne had said something about a particular tree in the local graveyard being possibly behind the haunting of this town. It was a silly idea at the time, and it was meant by the player to be silly, since the character who spewed it had an IQ that would make a cow look like a rocket scientist. Except as we were fighting the haunts . . . they appeared to have roots puppeting them . . .
We set fire to the tree and all the things fighting us died (again). It had, indeed, been the source of all the town’s troubles, like Brother Payne had said mere hours after they rode into town. I assume that soon after these events, somewhere in that universe, a somewhat broken Rory poured her heart out to a bartender over several glasses of strong spirits, wondering where she went wrong in life. I also imagine that shortly thereafter the Huckster invited her to play a game of cards, saying she should cheer up–the Payne siblings just got their paychecks and there’s good money to be had betting against them. And then Rory, weary and resigned to her fate, had another shot of whisky and went to earn more drinking money.